Community Bands are at the heart and soul of America's towns, cities and communities. The USA claims over 2,500 bands. In the Metroplex, there are probably 40 or more community bands. Traditional concert band literature, marches, patriotic pieces, religious songs, folks tunes and Broadway Musical favorites comprise the programs which are enjoyed by many throughout the USA as local musicians join the band to enjoy playing their instruments and provide entertainment in their communities. 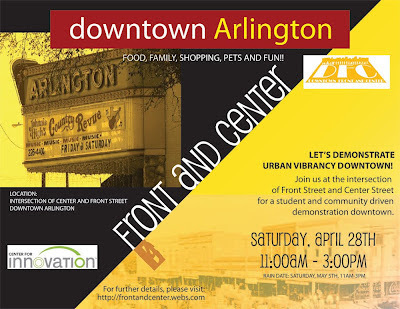 Front Street between Center and Mesquite Streets in Downtown Arlington, TX will be transformed into a vibrant streetscape and the adjacent vacant city-owned lot will become a park for one day, April 28, 2012 from 11 am - 3 pm. Masters Students from the School of Urban and Public Affairs and School of Architecture at The University of Texas at Arlington are partnering to create a unique economic development opportunity in the heart of downtown Arlington. Downtown Front and Center is a temporary “better block” and park installation inspired by previous projects in Oak Cliff and downtown Dallas. It will bring together local businesses, community organizations, and UTA students, and demonstrate how a currently underutilized space can develop into something that gives back to the community. It will help participants and visitors realize the potential of downtown Arlington. Local businesses, arts groups and artists will be there in addition to food and music. There will even be a pop up dog park. So come out and enjoy the fun. While you are there you can even stroll just down the block to the Downtown Arlington Farmers Market. The Arlington Community Band will be performing a live concert at Veteran’s Park in Arlington, TX on Sunday, April 22, 2012 at 4:00 p.m. Grab your lawn chairs, snacks and drinks and enjoy this free concert in the park.